So close. Looking forward to this quite a bit! Damn, it looks so nice. I have a feeling that it’s not going to be an August opening at this point. I’m hoping soon. I didn’t realize it before, but it looks like from the photo captions, they are adding a kayak launch near the bottom of the new switchback ramps! Great to see more water access as well! 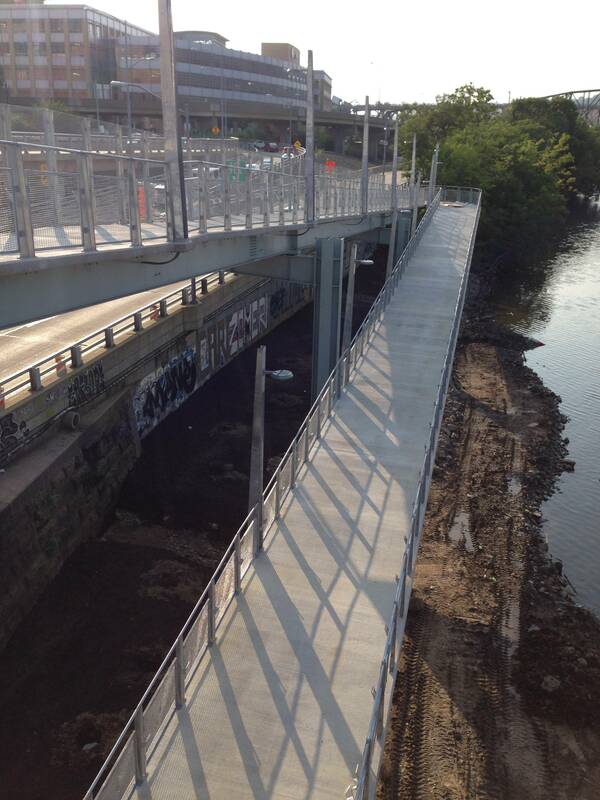 Does anyone know why the mon wharf switchback has been taking so long to complete? What is the expected opening before the snow falls? Did anyone get a photo of the project during the high water yesterday? At 27 feet, a good bit of the lower structure and of course the entire wharf would be underwater. I hope the project isn’t going to be delayed by the storm. I’ve been wondering that as well. I’m sure it’ll set it back the few days if the rain/flooding stopped work on it. But it was engineered to withstand occasional floods, I’m sure, so I don’t think this is a major setback. I rode by to check out the ramp again today. The water has receded and there doesn’t appear to be any damage. There is a couple inches of mud covering the surface of the lowest portion but that’s not concerning. It’s routine to spray off the riverfront sidewalks after flooding. It looks like the site was prepped beforehand, with material, gear and a portajohn moved to higher ground part way up the lower ramp. Hopefully the saturated ground won’t delay finishing of the warf where the ramp lands. It’s hard to confirm when covered by a layer of mud but i don’t think the warf paving stones stretched that far up river. There is probably some paving left to do. Handrails are still yet to be installed. Well, doesn’t look like it’s opening in September. I rode by last night and it seemed relatively complete with the exception of handrails being installed. Hopefully, the flooding will hold off and they can finish this up soon! Is the mon wharf switchback open yet? Soooo, looking ahead to when this opens, who’s going to clear the snow off the ramp? Or you could contact the council person’s office for downtown about that and maybe get them to plan for it. Vegas bookies project opening in 2020, based on state getting the Connector built. 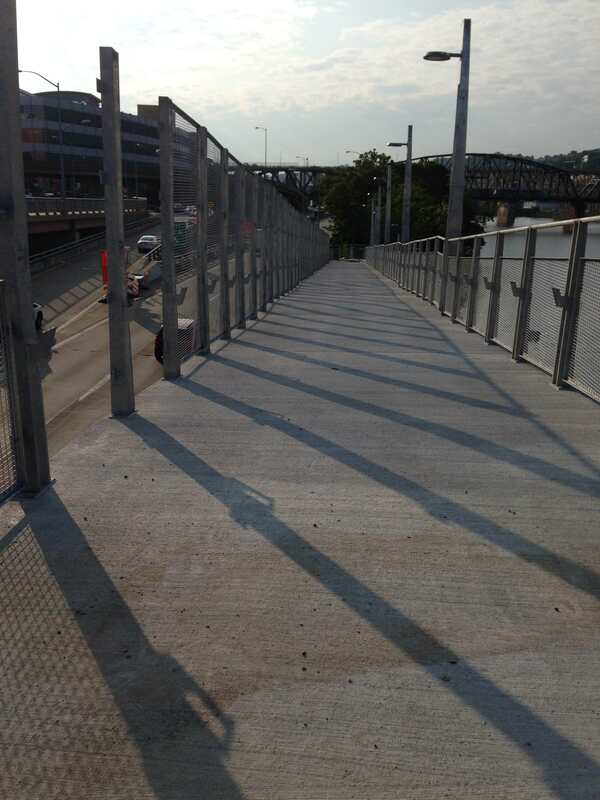 They cut the railing on the bridge end of the ramp! There was a guy installing lugs for bollards or a gate or something in the opening. Looks like all the railings on the ramp are done. Won’t be long now! I saw them too, asked if they had the inside scoop on when it’ll be open, but they said they didn’t know. Hoopla open or soft open? Not sure, the worker I asked didn’t seem very interested in chatting. I’ll definitely be riding by after work to see what progress they made today. Eric, thanks for your email. We’re all very eager to get this project open as soon as possible, but we do not have an estimated completion date yet. We are still waiting for a component to be manufactured and installed. As soon as we have a date, we will post it on our website and social media. Thanks for your patience. In any event, in case you weren’t aware of it, the trail along the Wharf is a mess. I’m not just talking about mud and the need for a good sweeping when the Ramp is open, but structural issues; like worn out grouting, large gaps where there were, I think, small drainage grates or expansion joints, … and the need for a curb cutout on the State Park end, etc. And I won’t startup about the trail markings and signs/poles across Grant from there…where the trail is shown to coincide with the traffic signs…oh there I go… :-| …. … Am I making any sense? If so, can this be corrected and who do we contact? 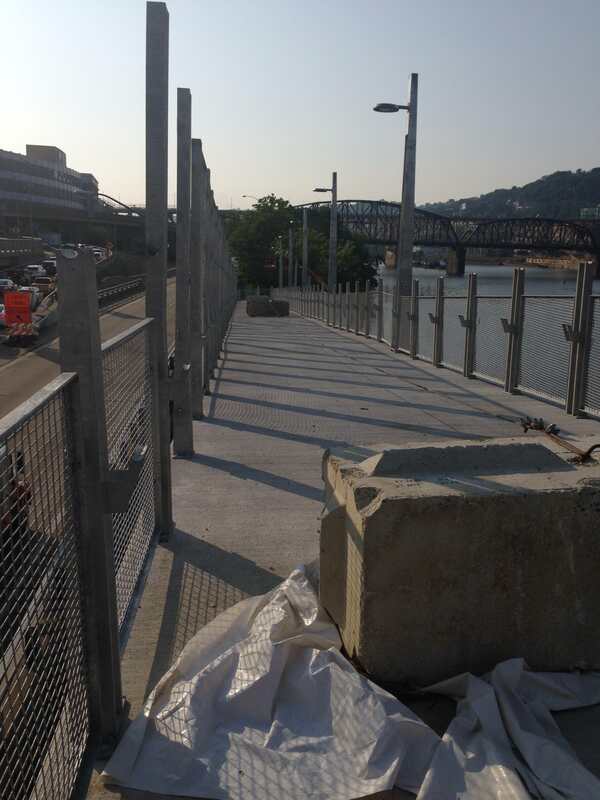 The Mon Wharf Switchback is nearly complete and we want to get it open as soon as possible. 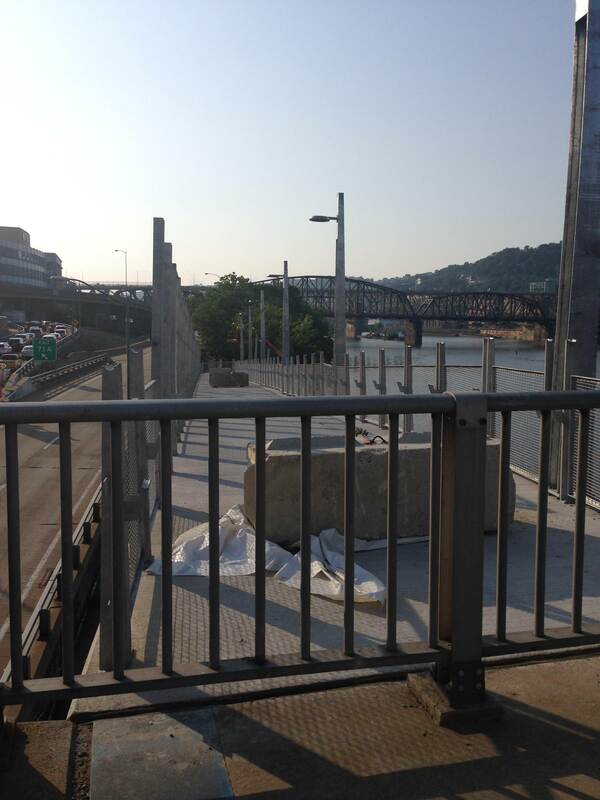 The rumor that we’re waiting to open it until the Point State Park Connector is built is a real head scratcher. 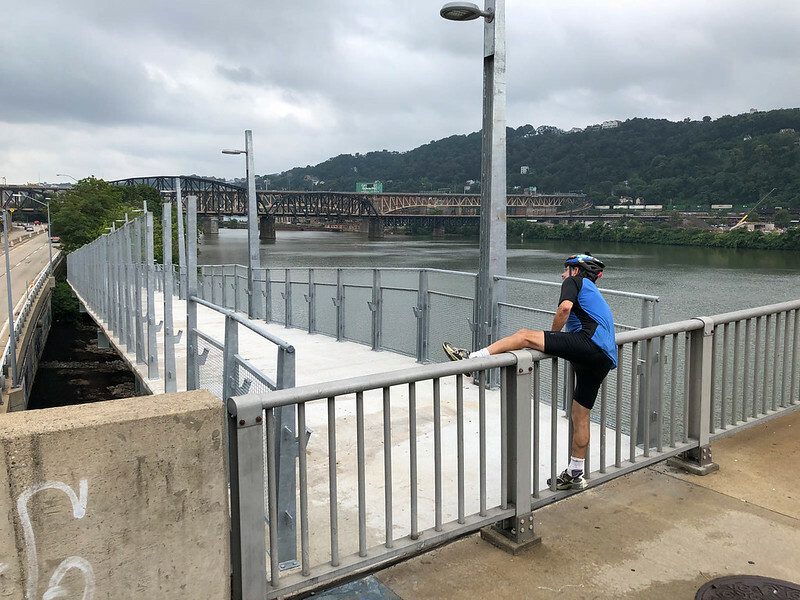 Our objective is to get the switchback open for pedestrians/cyclists as soon as we can – it wouldn’t make sense to build it and then have it sit there, unused, for a lengthy period while the other end’s connection is built. 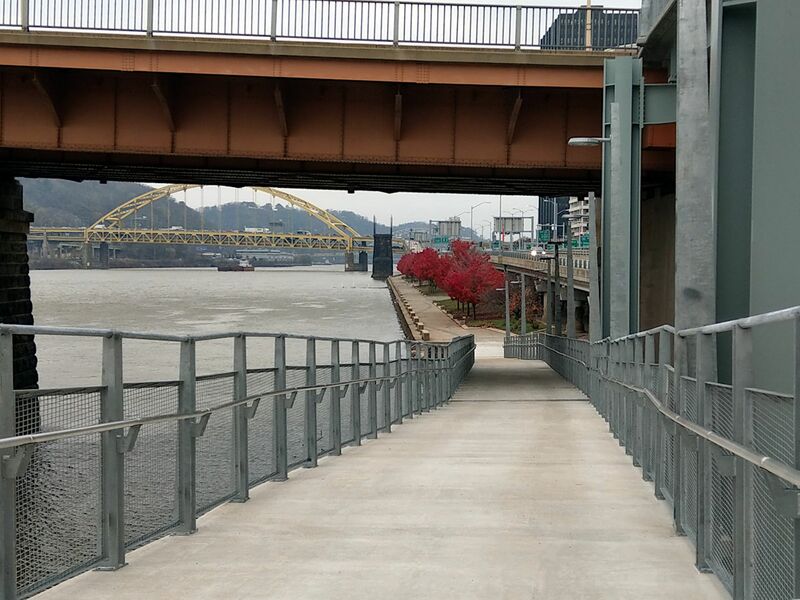 We want people to be able to access the Mon Wharf via the ramp as soon as it is safe to do so, even if the improved connection into Point State Park on the other end isn’t complete (with signage marking trail detours and ADA routes planned during construction on that end). As for the PSP connection, that project is being managed by the Department of Conservation and Natural Resources. The park rangers should have the most up-to-date information about their timeline for that project. As Riverlife has reported before, the Switchback is almost complete but we are waiting on a small but critical component to be fabricated and installed. 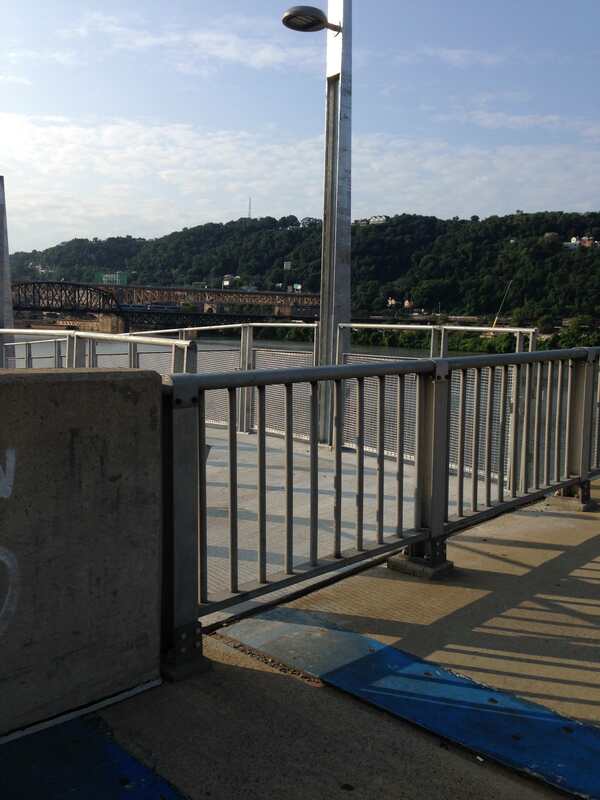 This component attaches the ramp to the Smithfield Street Bridge. The fabricator and contractor have varied in estimating the fabrication and installation timeline, which is why we have not had any specific dates to share thus far. We are cautiously optimistic that it could be any day now. We are aware of the numerous issues with the Mon Wharf Landing trail and are hoping they will be addressed in between the flood cycles. We have had maintenance conversations with the two main site stakeholders DPW and the Parking Authority, and the Parking Authority has pledged to replace the drainage covers that floated away leaving the ruts across the trail. The Parking Authority has also come up with a solution for the curb/drainage channel on the Point State Park end, which they assured me will be implemented soon. With all these improvements, we have to have patience. We are a small nonprofit working on other people’s property, with slim budgets and minimal site control. I appreciate the patience of the trail community and their excitement and enthusiasm for the improvements. 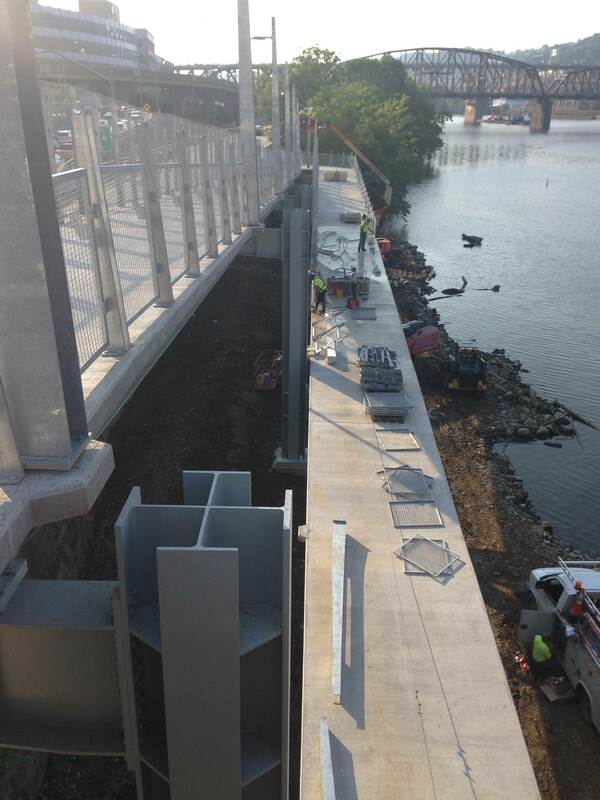 Here at Riverlife we cannot WAIT to get the switchback open after having raised funding, permitted, designed and constructed it over almost a decade. It has been a challenging project but well worth it, and I’m hoping we can celebrate this new public connection together very soon. Can we use baling wire and duct tape to make a temporary installation of the “small but critical part”? Of course. All problems can be temporarily fixed with duct tape. Some years ago I took a Greyhound bus to Latrobe. We pulled out of the Greyhound terminal in downtown Pittsburgh 30 minutes late, with the driver griping loudly that the bus hadn’t been prepped by maintenance so he had to clean it himself. A loud banging from the back started once we got on the highway. The driver pulled over, got out, and after a while reported that the engine cover on the back of the bus wasn’t latching, but he had applied duct tape to secure it temporarily. Ten minutes later, the banging resumed. The driver pulled over again and applied more tape. This continued every ten minutes until I got off in Latrobe, with the bus by that point 70 minutes behind schedule. The driver said he’d be able to switch to a different bus once he reached Philadelphia. I wonder now if he had enough duct tape to make it. My Grumman canoe has seen a lot of whitewater, and there are leaks around some of the rivets in the hull. Every year or two we put fresh duct tape on these spots and we’re good to go for a while. This reply was modified 5 months, 2 weeks ago by MaryShaw. What do you think is taking so long??? I went on a rampage! Has ANYONE called the Mon Wharf “inviting” before? This sounds real, but I haven’t heard anything else on it. Have you? Starting from the Point, go upstream along the Mon River on the bike/ped esplanade near water level, or from the main part of the park head past the museum toward the Mon. As you approach the Ft Pitt Bridge, enter the maintenance area. Continue under the Ft Pitt Bridge. You will probably see parkway traffic going past ahead of you. Spot the big blue dumpster to the right of the traffic and head for it. At the back of the big blue dumpster, between the dumpster and a “no left turn” sign, is a narrow walkway. The walkway is separated from the highway traffic by a jersey barrier. You’re safe from traffic on the river side of the jersey barrier. Go down the walkway to Mon Wharf Parking. Switch over to the bike/ped esplanade along the river when you find a place without a curb (this will get you past the open trenches) and continue to the switchback. I annotated photos to help explain this, but I have not been able to upload photos here for a long time (involving mulitple browsers and reboots) — the photos are on my Facebook feed.